Hiking fashion is a funny topic for most of us. It’s typically the last thing on my mind when going out on a solo hike. All I really care about is comfort and functionality. Ask 100 hikers what they should wear on a hike and they all tell you the same thing. You can either wear comfortable shorts or long hiking pants. Over the past couple years I’ve seen a lot more skirts and dresses on the trail. Once the weather starts to warm up, it’s nice to ditch my long pants and trade them in for a nice breezy dress. Nothing beats a dress during the heat of summer. If you’re wondering if you should ditch your shorts for a dress this article is for you. Should You Hike in a Dress? In the warm summer months you’ll normally find me in a dress out on the trail. Companies like Columbia and Outdoor Research are even jumping on the trend. Check out Columbia’s line of hiking dresses they’re so cute! Should you hike in a dress or skirt? What are the advantages/disadvantages of hiking skirts over more traditional options. In this article I’m going to discuss everything I like and dislike about hiking in a dress. When I thought about all the gear I might need on a hike dresses/skirts never entered my mind. I thought that I’d be wearing a pretty standard hiking wardrobe, shorts, pants, athletic clothes and that type of thing. However, in my day to day life I actually prefer to wear a dress whenever possible. It’s all about making my life easy. You don’t have to pick outfits and figure out accessories. As I spent more time on the trail I started to hate my traditional hiking wardrobe. When the weather started to get warm I had some serious issues with thigh chafing. Switching over to a dress quickly addressed the problem. It was cool/breezy during the summer and just felt more comfortable on those long hikes. Cool and Breezy: Staying cool is the main benefit of wearing a dress on the trail. Reduces Chafing: Fabric rubbing against your leg will eventually cause chafing. With a dress you won’t have to worry about moisture build up between your thighs and rubbing. Feels Normal: I try to wear a dress/skirt multiple times throughout the week. So throwing one on for a hike just feels normal to me. Simple to Get Dressed: Since dresses are only one piece it’s easier to get dressed on long backpacking trips. You just need to toss it on and you’re ready to go. Odor and Sweat Resistant: Most dresses that are designed for hiking are completely odor resistant. Nobody likes the way they smell after a long hike, but even if you smell your dress won’t. Multipurpose: You can wear a hiking dress around town without feeling out of place. They just make you look more put together. Somewhat Revealing: Wearing a dress out on the trail can put you in precarious positions. Nobody wants to show off their behind when climbing up a hill. Bad in Rain: Dresses might be great on warm sunny days, but they’re awful in the rain. All that extra fabric bunches up along your thighs causing serious chafing. On rainy days you might want to wear a pair of volleyball shorts instead. Pack Straps Rub: Unless you have thick shoulder straps your pack is going to rub. You’ll eventually get used to it, but at first that’s going to be uncomfortable. 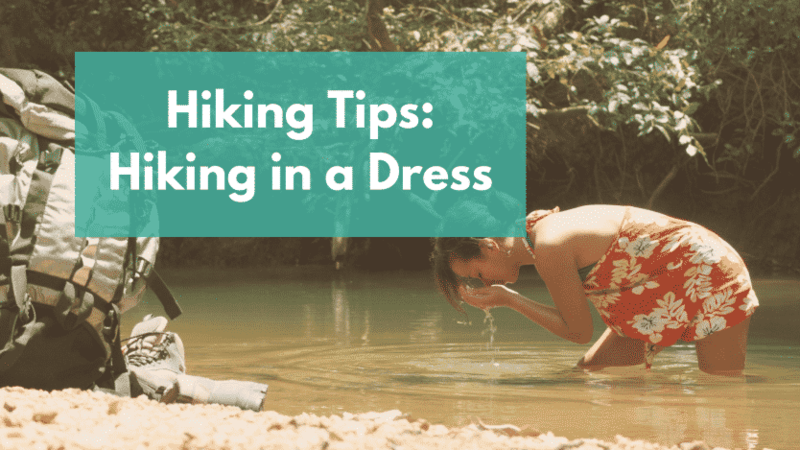 When Should You Hike in a Dress? Only wear a skirt/dress when hiking on flat and easy terrain. You don’t want somebody walking behind you and looking up your skirt. If you’re concerned with modesty you could always wear a dress with spandex workout shorts underneath. Just remember that you never know what type of scenario you’re going to run into. Some days you’ll just have to deal with the wind and pray nobody comes up behind you. What if Someone Sees Up Your Dress? We all have concerns that somebody is going to see up our dress. This is why I avoided them for so many years out on the trail. Honestly, it isn’t as big a problem as you think it is. Just have some common sense and avoid steep inclines. You just have to accept that some days you aren’t going to be able to wear a dress. What’s the worst thing that can happen? The bathing suit you wear to the pool is probably more revealing than what’s under your skirt. If you’re feeling uncomfortable you can always wear modest underwear. Throughout the years I can count on one hand how many times I’ve felt uncomfortable. Just don’t wear a dress when you’re facing steep inclines or the winds particularly strong. You can almost always find a path that doesn’t expose you to the world. Go with styles that are long enough to offer decent coverage. Think about styles that were acceptable in high school. Knee length skirts offer plenty of coverage while maintaining most of the benefits. Obviously, you don’t want to wear a dress when traversing steep technical terrain. It really all boils down to having some common sense. If you don’t want someone to look up your skirt don’t give them the opportunity. That being said sometimes you’re just going to have to deal with a little wind. Just wrap a jacket around your waste and try to keep it under control. Built-in bras sound like a great idea, but they often cause more problems than they solve. It just ends up being more of an annoyance as the day goes on. It doesn’t matter what type of material your dress is made of, the bra will eventually get wet. The padding soaks up sweat and causes your bra to bunch up in a very uncomfortable way. Also since the bra is thicker than the rest of the dress it will take longer to dry.